Feature photo by uberculture. Photo above by Theodore Scott. Four simple gardening projects for those who don’t have much space. IF YOU WANT TO TRY gardening but don’t think you have the space, then these four garden projects are for you. Even if you have a yard, the approaching winter is a good opportunity to experiment with plants indoors. 1. 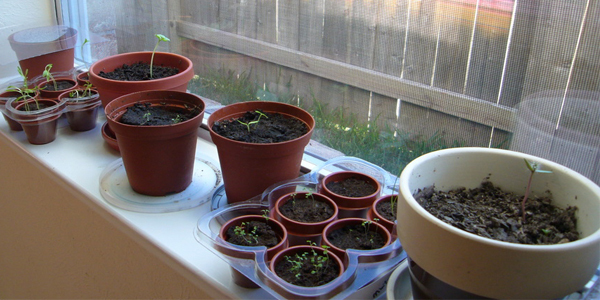 Start a windowsill herb garden. It is easy to keep fresh herbs on hand for cooking. Make a list of your favorite herbs. Round up some seeds, put some potting soil in some containers and scatter the seeds around. Keep the soil damp. Covering the container with clear plastic creates a miniature greenhouse that helps the seeds start out. Place your containers in a sunny spot and wait. Remove the covering when you have some seedlings that are doing well. Once they start to outgrow their original containers, transplant them to larger ones and spread them out. Once you have some large plants, you should harvest frequently. This encourages the herbs to grow. Some plants are finicky about their light and temperature, so try a variety. Lemon balm, chives, rosemary, and parsley all like full sun but will make do in more shaded areas. Start a lot of them from seed and experiment to find out where they will survive in your home. 2. Take cuttings from common houseplants. Many stems cut from a plant will form roots and grow into new plants. Often, just taking a cutting and sticking it in dirt will be enough to get a new plant. If you want to watch the roots grow, you can place the cutting in a jar of water. Over the past year, I have turned one tiny neglected ivy plant into five medium-sized houseplants. When they get too shaggy, I cut a few stems and transplant them into other pots. Just spread them around the house. When you have too many, give them away as gifts. Some plants are easier than others, and researching the species can help. Usually, I just do several cuttings and see how many survive. When you cut off a piece, use a sharp knife to limit damage to the surrounding plant tissue. Strip off the leaves near the bottom and bury at least one of the leaf nodes. Cuttings from lower on the plant will develop roots more easily than a cutting from the stem tip. Don’t shock the parent plant by taking a huge piece. A three-inch cutting should be enough to start a new plant. Friends and neighbors with houseplants are a great source for free cuttings. Create your own little green world. Find a glass container. Wash it. Put half an inch of sand or rocks in the bottom and a couple of inches of potting soil on top of the sand. 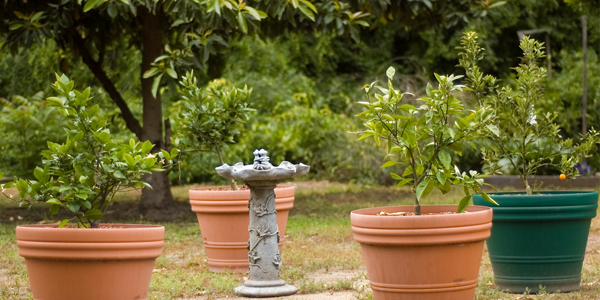 Choose some slow-growing plants that have similar light and water requirements. Scatter a mix of seeds and a little more soil to cover them. There isn’t any drainage, so don’t water your terrarium too often. 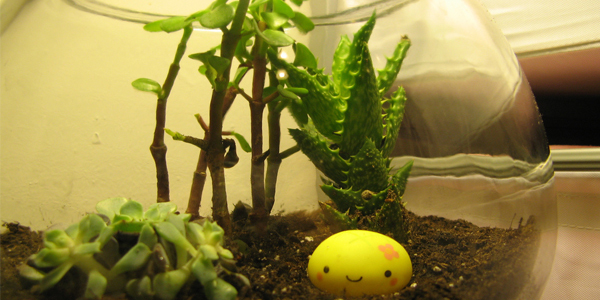 If your terrarium has a lid, you can cover it (not airtight) or leave it off. Your choice will affect the humidity inside, but either way is fine. If you cover it, watch out for mold. When your plants start getting big, pinch them back. They will become short and bushy, and less likely to outgrow the container. 4. Grow a fruit tree indoors. Get a dwarf fruit tree. There are many suitable types – grapefruit, kumquat, lemon, limes, figs, oranges, and more. These are small trees, but given proper care, most provide fruit. Find a good local nursery that has dwarf fruit trees available. Ask for advice on how big the container for your tree needs, how fast it grows, and how long until it produces fruit. Pick a lightweight container. If you want to move the tree often, then consider getting a wheeled platform to put underneath. 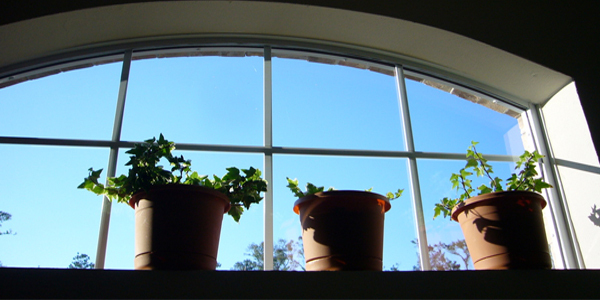 Find the window that receives the most sunlight and put it nearby. If your patio or balcony that receives sunlight through most of the day, then keep the tree there for most of the year. Be sure to bring it in when it gets cold. Many fruit trees don’t stand up well to freezing temperatures. Don’t overwater. Water when the soil surface is dry. Once every 7-10 days should be enough, but you will learn to judge.